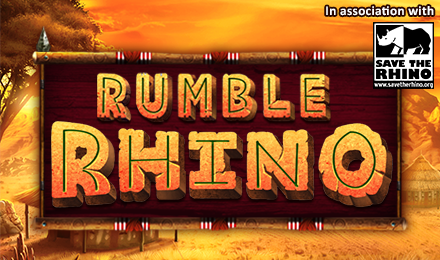 Cross the hot African savanna in search of potential wins with Rumble Rhino Slot from Pariplay at Wicked Jackpots. This 6-reel, 100 payline video slot is set within the famous African grasslands, comes with a few extra features. The gameplay takes place amongst a sun-kissed grassland, with a settlement located at the centre of the screen. The reels are placed on top and contain many colourful animals which are revealed when the reels are spun. You will find Rumble Rhino at Wicked Jackpots. Begin your safari by entering the amount of the wager, using the + and - buttons found at the bottom of the screen. When the size of the wager has been confirmed, press the Spin button to start the game. There is also an Autospin feature available on Rumble Rhino, which allows the player to choose the number of spins to play automatically. Bet Levels: Rumble Rhino has no bet levels. Amount of Paylines Selection: You will find 40 – 100 paylines in Rumble Rhino. Coin Values: The minimum is £1.00, and the maximum is £50.00. If the Mystery Mask appears. All mask symbols transform into the symbols around them triggering potentially large wins. The Mystery Mask will not change any of the bonus symbols. The Mystery Mask can also be a 4x4 “Mega Symbol”. All masks can reveal a similar symbol. These symbols are an alternative way to land the highest paying symbols on the reel. They are usually found on the 2,3,4, and 5 reels at the centre of the screen. Uncover the Bonus Game symbol on reels 1 and 6, to open the “Bonus Game” feature. This takes you to a new screen where 24 diamonds appear. Behind each diamond there is a bonus, you must match three to unlock prizes. The Rhino takes the place of the wild. This means it will take the place of all the main symbols. It also can pay-out five times your stake. It also turns up in the 4x4 block when it appears in the centre of the reel.